Vacation rental house. 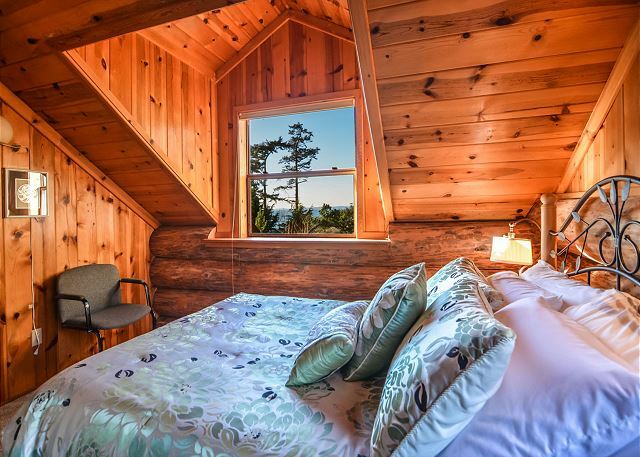 Sleeps 7, 4 bedrooms, 3 bathrooms. No pets allowed. Welcome to West Side Estate! Witness beautiful sunsets over the sparkling water. 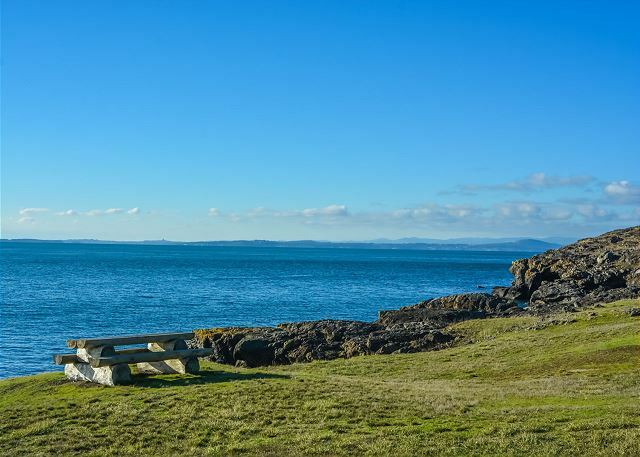 Enjoy a picnic by the sea while you watch for whales and other sea life. 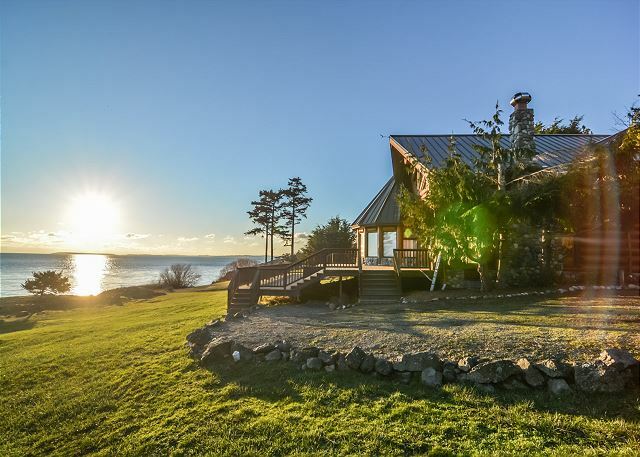 The west side of San Juan Island is known for its high number of whale sightings. From the comfort of this home you can watch them all swim by. Enjoy a 180 degree water view while you dine on those delicious recipes you have been waiting to try. 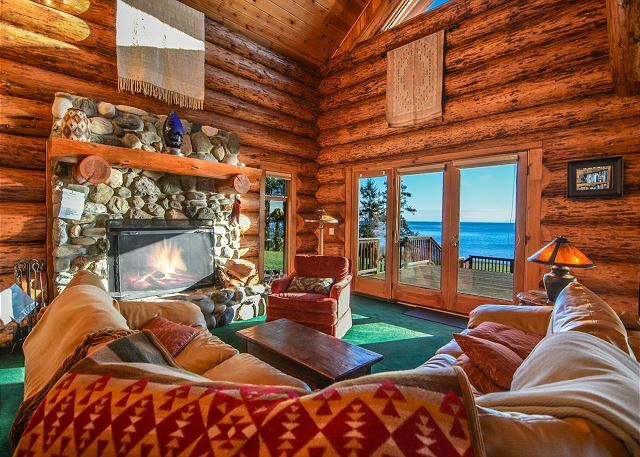 There is beautiful custom log work through out the main house. A roaring fire is the perfect end to a fun and adventurous day on San Juan Island. 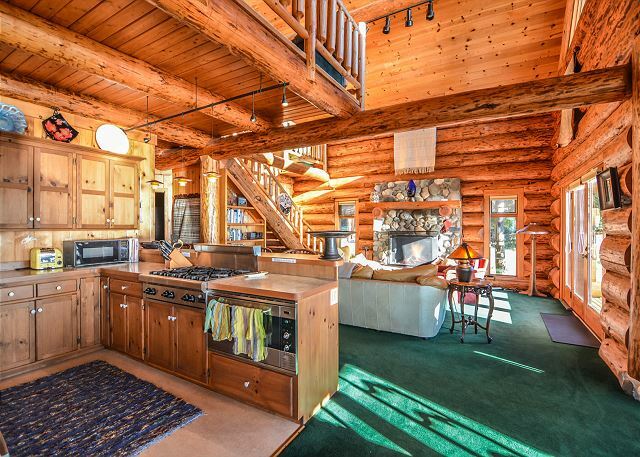 The beautiful log work throughout the home gives the interior a warm and cozy feel. The main floor master bedroom. 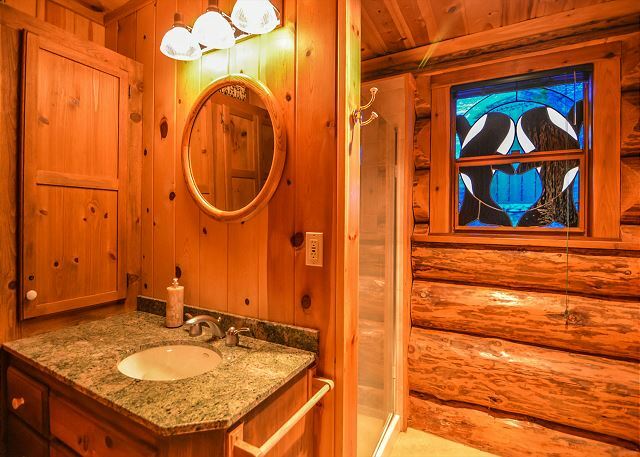 The master bathroom with beautiful stain glass is also used as the main floor bathroom. 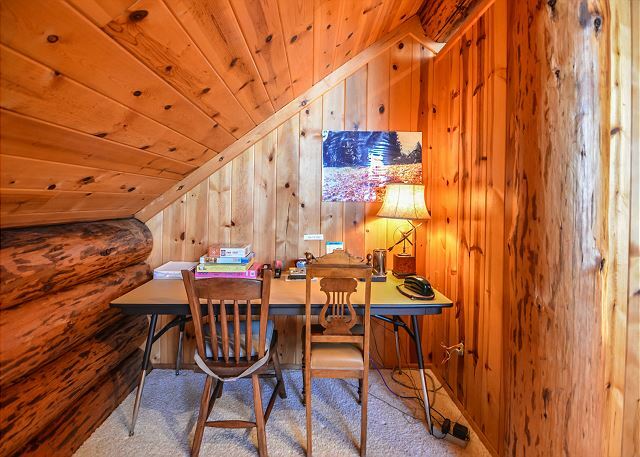 The log staircase that leads up to the loft. 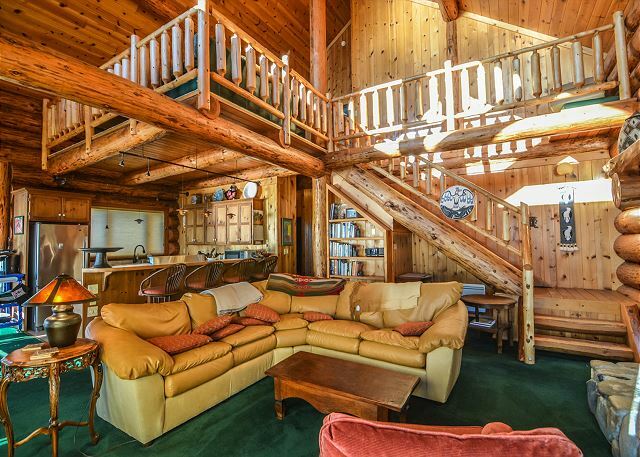 The open loft area with flat screen TV is a great cozy spot for watching a movie. The loft desk is a great place to focus on some work. 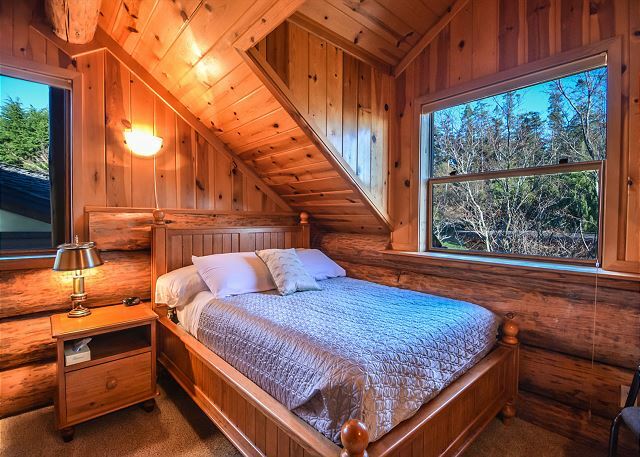 The first upstairs bedroom with queen size bed and a shared hall bathroom. The second upstairs bedroom with a shared hall bathroom. 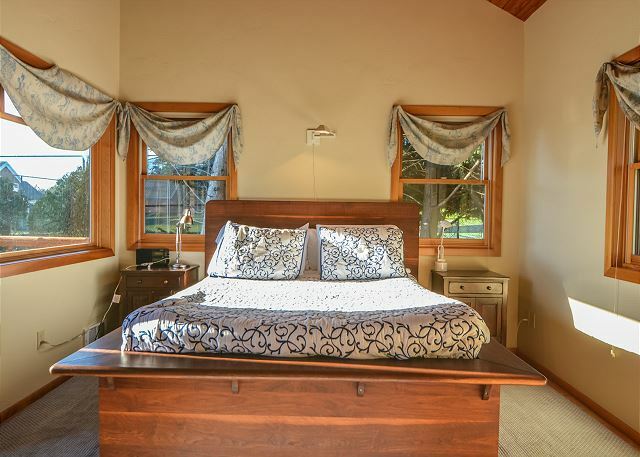 The guest house is considered the fourth bedroom and features a queen size bed and private bathroom. Views of the water from the guest house kitchen. The guest house bathroom with beautiful tile work and a tub/shower combination. The guest house with queen size bed. Views of the quaint front porch from the guest house. The indoor pool is a wonderful vacation amenity. 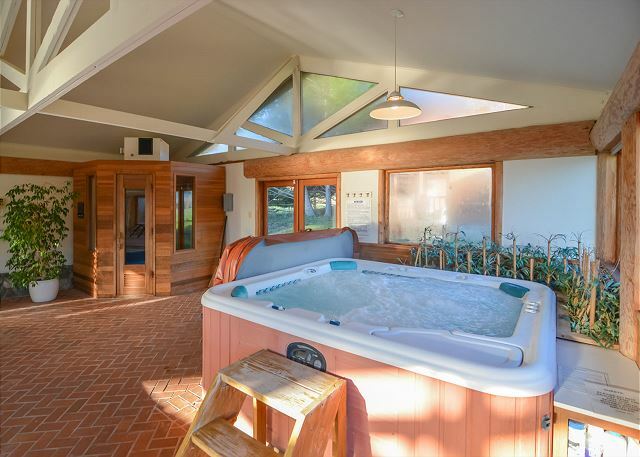 A large hot tub is available for use year around. After your hot tub soak make sure to enjoy the sauna. An outdoor basketball court with fencing is an ideal bonus amenity. The views from the deck and the main house are what island life is all about. 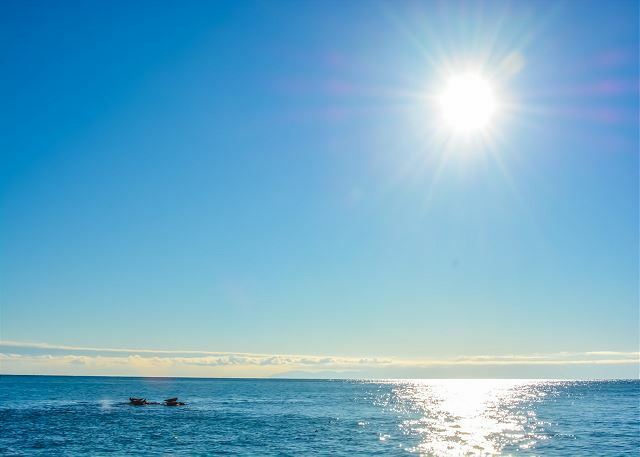 Seals enjoy soaking in a few rays of sun before slipping back into cool salty water to play. WEST SIDE ESTATE IS A TRUE ESTATE PROPERTY FEATURING AN INDOOR POOL, PRIME WHALE WATCHING AND VIEWS BEYOND COMPARE! The main house features a combined living room, dining room, and kitchen area. The large leather sectional faces a beautiful stone fireplace and enjoys patio window views of Haro Strait. 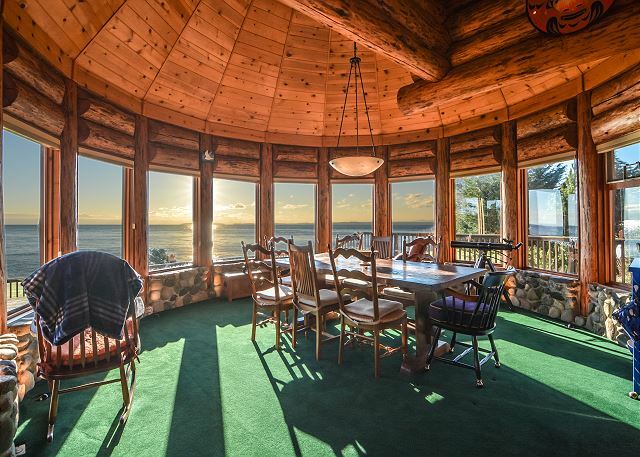 The dining room table sits in a pocket of windows with cathedral ceiling above and features the 180 degree water view. Several stools along the kitchen counter make a great breakfast bar as you prepare your morning eggs and pancakes on a commercial-style gas range. Above the lower portion of the Great Room is a loft that is a perfect spot to curl up watching a good movie on the large flat screen TV. There is also a detached guest house with a full bed and its own bath, separated from the main house by the pool building. A main attraction for your stay at West Side Estate will no doubt be the pool house featuring a large swimming pool, a hot tub and sauna. 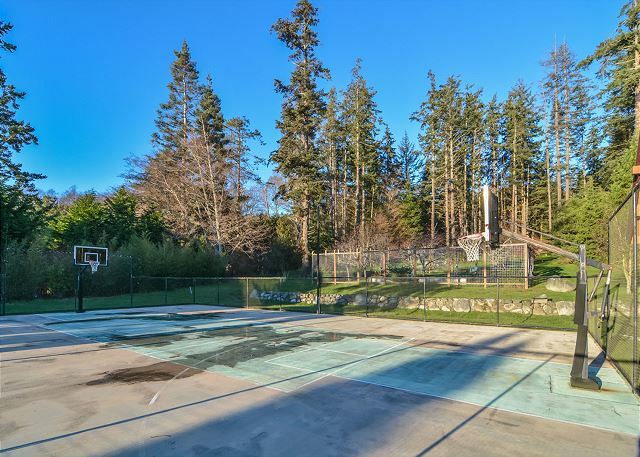 A basketball court is located between the garden and pool house which puts this home over the top as far as special amenities.The waterfront area has tide pools to explore at low tide and is the best venue too for the whales that often swim by and feed along the western side of San Juan Island! Please note (THERE IS A $300 CHARGE FOR USE OF THE POOL IN THE SHOULDER AND QUIET SEASONS, NO CHARGE IN PEAK SEASON). Absolutely NO PETS-the property is a wildlife sanctuary. A $500 penalty will be charged if violated. No structures (tents, canopies, etc. ), large inflatable toys or similar items on the property. Also, in respect for our neighbor/s peaceful enjoyment of their properties, absolutely no parties or gathering of visitors beyond those registered for occupancy, will be permitted. This beautiful property is meant for our guest's respectful enjoyment only..
We had a great time in a beautiful, well equipped, and perfect location home. Not only was it convenient to town with great views, ideal for site seeing wild animals including whales that entertained us for 4 hours. We could not have chosen a better place to spend spring break with our kiddos! We will certainly come back again and again! We were two families both with small kids and the property could not have been better. Plenty of space for all and easy to have our little guy nap while the other kids played outside or swam in the pool. We also loved how clearly a chef owns the place with the huge BBQ, high end stove and oven, and every pot & pan & cooking tool you could ever need! That was a real bonus for us. 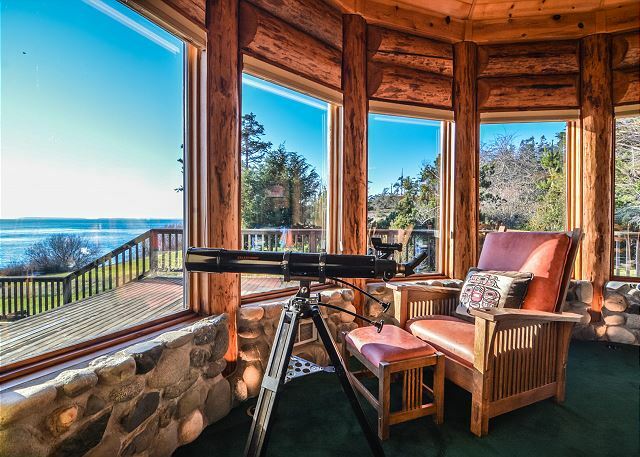 Location is absolutely stunning and situated almost equal distance between Friday Harbor and Roche Harbor. Perfect location for day trips around the island and a bit of quiet each evening. Perfect for a family (or two!). 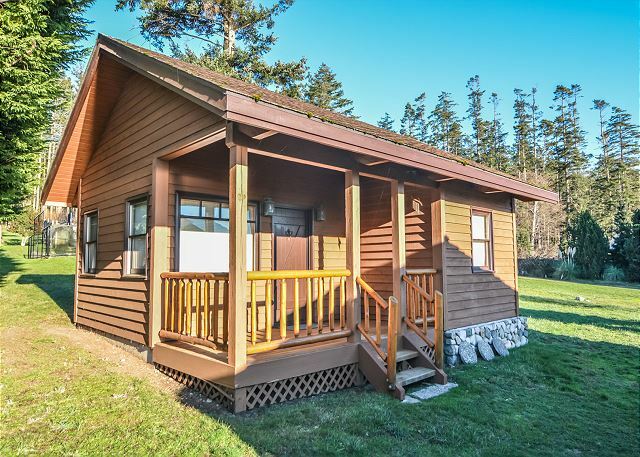 We had 9 adults and an infant in our group and the West Side Estate accommodated our group perfectly. We had plenty of room for both gatherings and privacy. The front deck is very spacious and we spent much of our time enjoying the beautiful view. The house is well stocked and very comfortable. We would definitely rent this property again and recommend it to other large groups.